1st Place:Mitch Bair and substitute partner, CJ McCafferty, found a spot in practice that was much better than they had thought, “We knew the area was good for 10-11 pounds, but thought it would take at least 15 pounds to win,” Bair confesses. And on their way to weigh in, they didn’t think they had a chance. But their 11.30 pound limit was enough to take the top honors and pocket $648. 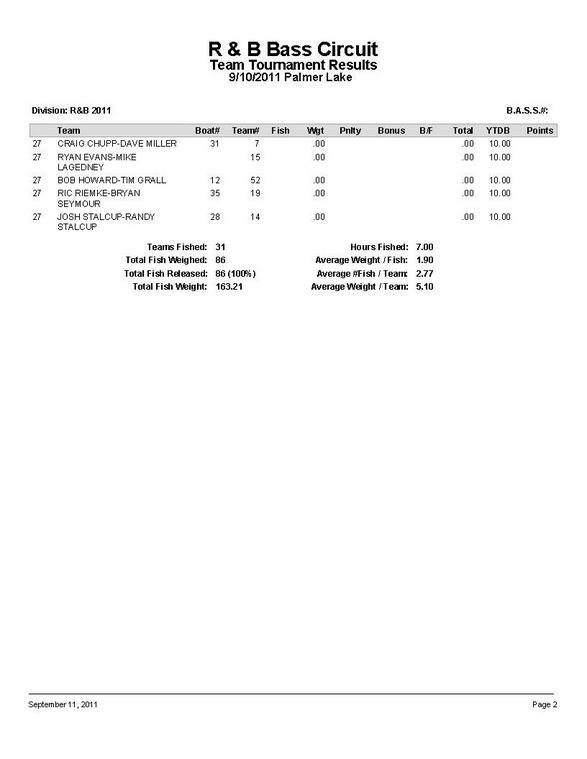 After 6 tournaments, 692 fish over 1,261 pounds and $13,000 the 2011 R & B Bass Circuit season has ended. All that remains is the Classic at Gun Lake. Congulations to Teddy Bradley and Mark Fennell for becoming the 2011 Points Champs. The tournament directors want to thank Mark Fennell, Steve Prange, Dennis Losee, and Rick Bauer for their help at this event. Because of their help, we were able to launch a 31 boat tournament few thought was possible. We also thank the participants for their willingness to work with us. The entire season was a success not because of tournament directors, but because of the quality of people who participated. Palmer Lake proved challenging as only 7 of the 31 teams caught limits. And despite being a lake known for heavy weights and big fish, only 1 fish over 4 pounds was weighed. Their sweet spot was shallow, real shallow. Bair admits, “Our biggest fish (3.4 pound largemouth) came in 1 foot of water.” The sweet spot was unique because it possessed green weeds in an otherwise weed-killed lake. They made 4 passes through the area and picked up 6 keepers, including their big one, before going elsewhere. Bair explains, “We had another spot by the dam, but when we arrived Derek Deardorff and Todd Melson were sitting right on it.” The winners showed patience and respect, “We fished elsewhere until they left, and as soon as they did we went in there and caught a few keepers." Their sweet spot was on the mainlake and they fooled those fish with crankbaits. In front of the dam, they caught their fish with jigs. 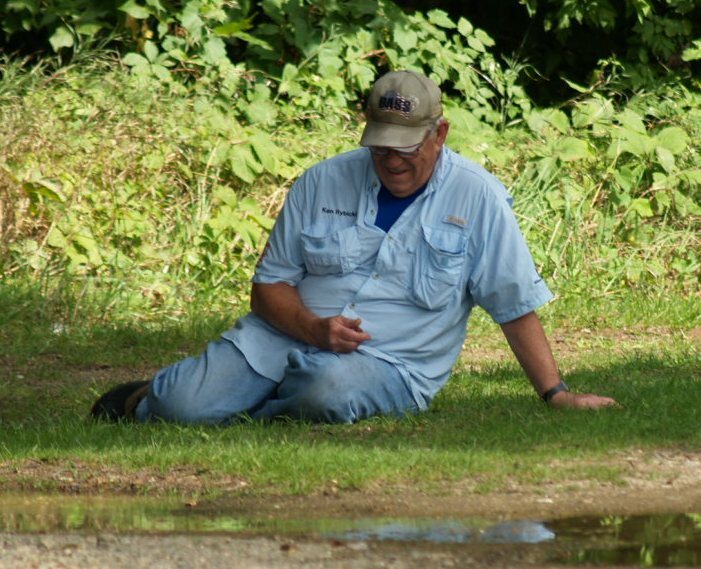 Ken Rybicki wore himself out catching fish. OR, perhaps, it is past his bedtime. He explains, “I was on my way back to the ramp and saw on my sonar some small weeds in 6-7 foot of water and marked it on my gps.” Practice had produced some quality fish in the stump field and under docks so at the tournament they naturally began there, but when that did not produce, on a hunch, they ran to the weeds. Almost as soon as they put the trolling motor down, Bennett caught their first keeper with a crankbait. They then soaked the area for all they could muster. They caught many small fish, but also 3 more keepers. Most importantly was the quality of fish. They only had 4 keepers, but they weighed an impressive 10.69 pounds and were anchored by a 3.42 pound largemouth. Their good decision making and execution earned them $405. In practice Mangus and Fletcher found an area with a sandy bottom and scattered weeds close to the launch. They were also fortunate to draw a low boat number. To the astonishment of anxious anglers, they began catching fish immediately in plain sight of everyone. Mangus confesses they caught their fish in a “Big, general” area and they did their damage of 2 different C Flash crankbaits: 22 and 38 series. The fish came between 2 and 5 foot of water. The C Flash seemed to be the key component. Fletcher tried several other brands and had no luck while Mangus boated one after another. Eventually Fletcher gave in and tossed a C Flash and caught up. They landed 13 total keepers. 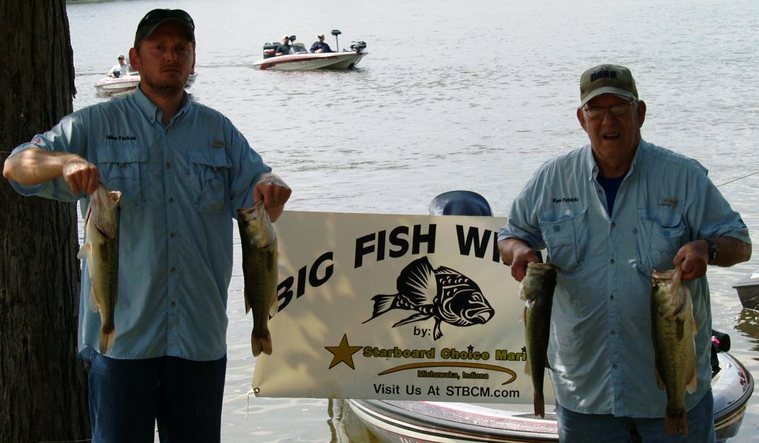 Their best 5 fish weighed 9.97 pounds and won them $243. 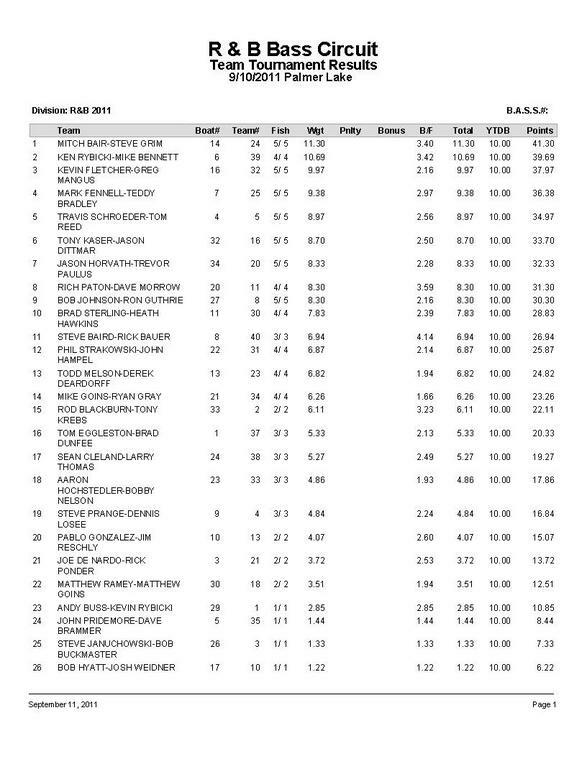 It also placed them in 2nd place in the final Standings. 4th Place: Wire to wire probably says it best. 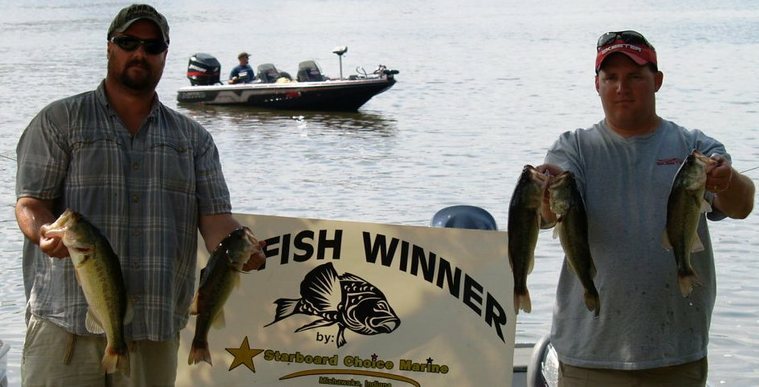 Teddy Bradley and Mark Fennell won the first event of the season on Lake Manitou and never looked back. They finished in the top 5 four times and won money 5 of the 6 tournaments. Their finish at Palmer Lake was ordinary for an extraordinary season. They brought 5 fish to the scales that weighed 9.38 pounds and won $162, but their efforts will be rewarded with an additional $200 for becoming the 2011 Points Champions. The champions were ready for this tournament when they took off. They had 2 waypoints they felt they could catch 10 pounds. And with a 12 point lead on Mangus and Fletcher, it would take an incredible catch to be caught. The only curveball that was thrown their direction were the colors of crankbaits. “We were forced to use different color of crankbaits than what we got them on before,” Bradley explained. They ended up tossing crankbaits of translucent colors. 5th Place: Like the other winners, Travis Schroeder and Tom Reed found a sweet spot. That sweet spot was a trench on the flat leading towards the river. The trench produced but not like they were hoping. Schroeder recalls, “We soaked it for all it was worth, but it only produced 3 keepers.” Luckily 3 keepers is more than 50% of what the field caught in 7 hours. They fooled those 3 fish with jigs. They caught 6 keepers through the day and their best 5 weighed 8.97 pounds and won them $98. 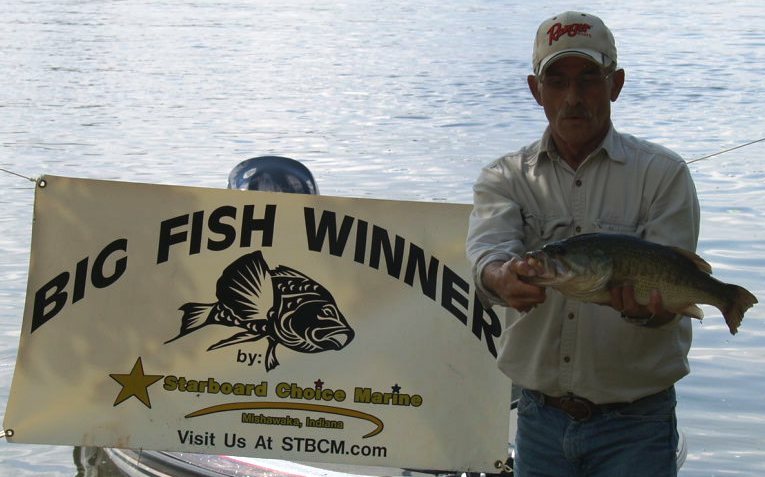 Starboard Choice Marine Big Bass Award was caught by Steve Baird (pictured) and Rick Bauer. The 4.14 pound fish was caught on a Mojo rig matched with a green pumpkin/purple worm hooked wacky style. 6th Place:Tony Kaser and substitute partner Dave Eggers caught a limit weighing 8.70 pounds and won $64. D's Lures Award:Jason Horvath and Trevor Paulus brought a limit to the scales that weighed 8.33 pounds. That spot was close to the ramp, but the incredible part was Rybicki never made a cast there in practice; call it intuition.